I am sure many of you, who are from the Southern part of India, would drool over this quick snack, which many of you love, but might have forgotten its existence. 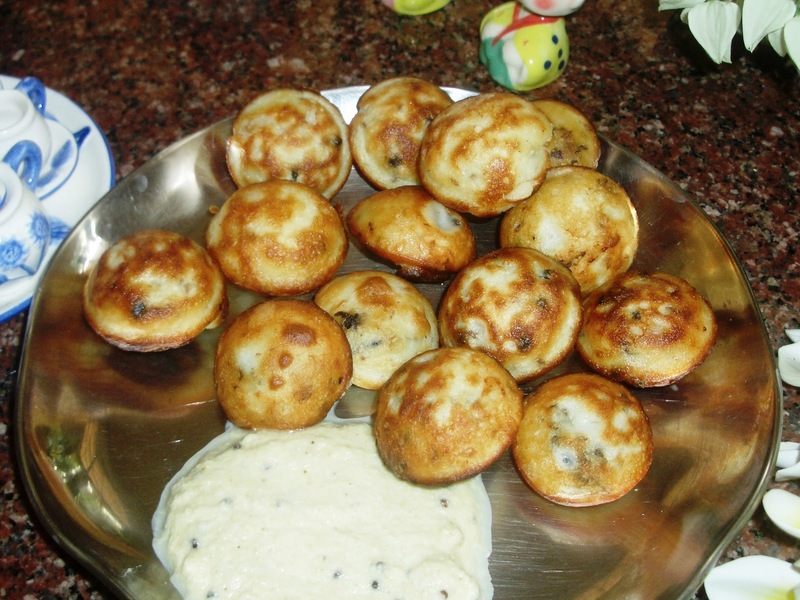 These are made out of Dosa/ Idly batter, by adding some cumin seeds, pepper, green coriander, curry leaves, and some times onions and green chillies are added too. Which ever way you make it is a winner. 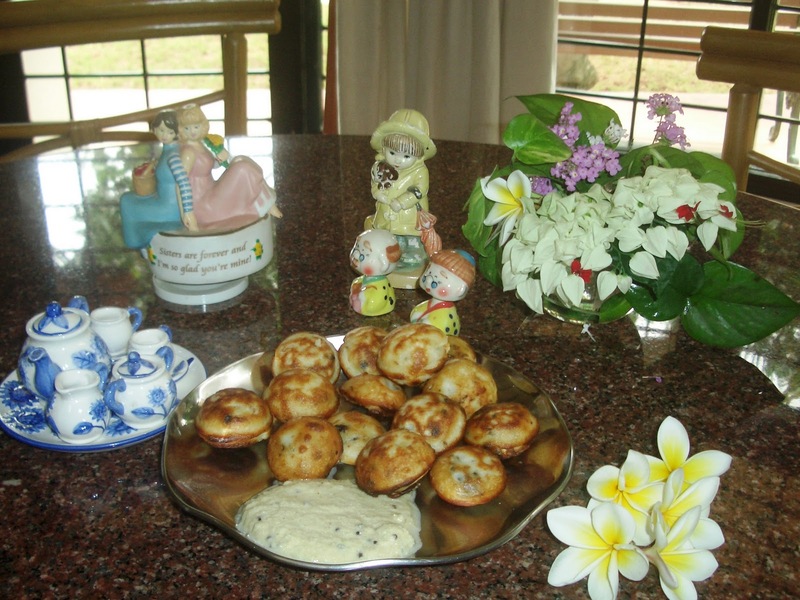 The usual accompaniments that go with this snack are: special Idly/ Dosa Chilli powder, Cocomut Chutney, or if you like these small balls can dumped into Sambhar and enjoyed. Today, I just realized that, I had all the ingredients for making this quick snack, and so here it is. As you might be knowing that it is made in a special pan with moulds in it, and it is a non stick pan made by Prestige cookware, specially to make sweet appams/ sweet rice / wheat flour pancakes made with jaggery and cardamom, during festival time. 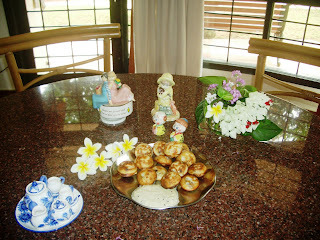 As usual I have some guests, who are all ready to taste this tasty dish with us. Let me introduce them to you, they are: two sisters, promising undying love for each other, and they play a beautiful music as they turn a few circles. Japanese Grandpa and Grandma who have also come to grace the occasion of fun and food. A very cute girl was passing by with her cute puppy and an umbrella, who too, was invited to come and share Tea and snacks with all of us. 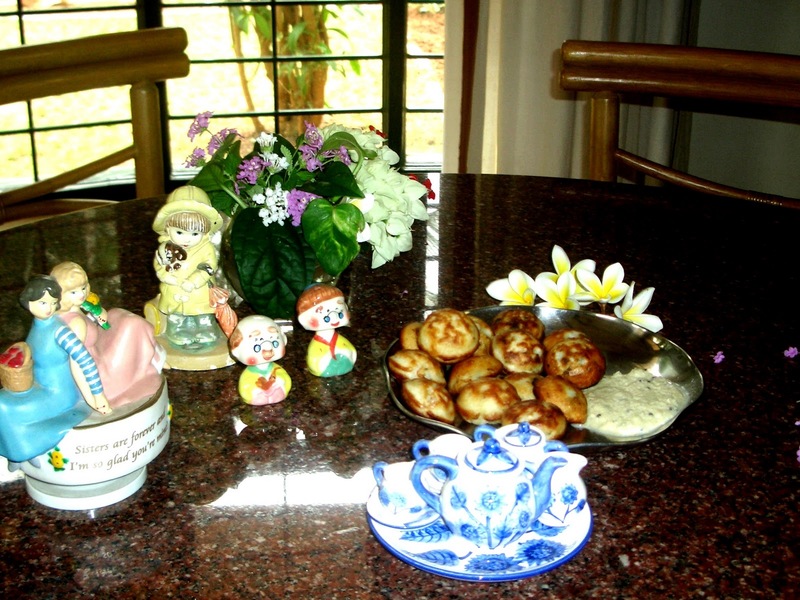 So here we are enjoying the Tea from the blue tea set from Thailand, listening to the musical sisters, and fragrance from the flowers and the delicious, mouth watering, snack Vellai Appams. Rain too has come to enjoy with us, what more can we ask? I am sure this would definitely make you yearn for good authentic Indian food. I wish I could help. Rama, you are making me hungrey too! I have to go 160 miles to Portland to find a decent Indian Grocer, but I think I will make the drive! Sarmistha: you can make it the dosa tava/flat pan, you need to make small uthappams, like you would have to use a tablespoon and just take 1 spoon of it and drop it on the pan and don't spread it like a dosa. You can make 5 at a time. It will be small and rise up a little bit, but won't rise up like an Appam, but still the taste would be as good as done in the appam pan. Because the pan has rounded moulds it comes out in a round and puffed up shape. I am going to try this. :) And I have all the ingredients and the non-stick dish too. Thank you. hmmmmmmm.....i can smell the aroma and feel the appam's taste somewhere etched in my memory. As usual, the figurines add to the beauty. The Thai tea set too is wonderful. I loved the white champak flowers arranged in the foreground. Good post! 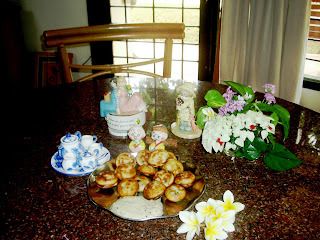 ohh..how I wish that i was passing by there too..lol..loved ur write up..
Pastries look really nice didi!! love! pastries looks really good didi! Beautiful presentation.Mouth watering ! I am surely going to try make them.I admire the positivity you exude through your post. They are my favourites and I have the cast iron pan for this.. I missed my dear old couple being invited over! your table decorations are always beautiful..BTW what is the meaning of vellai? 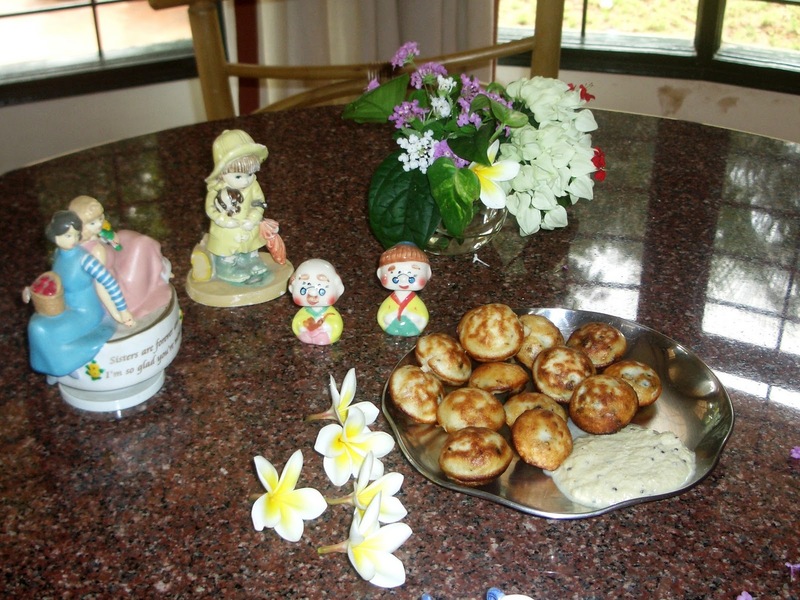 Renu: Vellai means white, because it is not brown inside like the appams made with jaggery, and it is made of Dosa/ Idly batter. You must be knowing for I think you live in Madras. Cute appams Rama. The Goddess surely has been kind.Thanks for the kind words. They look and seem yummy :). My younger one's favorite dish. I make it often. Will make it for one of our meetings next week :). They love it.